I'm sometimes wondering if some companies leak betas on purpose to create news about their upcoming products or if this is just the way it goes in the software business. A beta version of the upcoming Real Player 11 has been leaked and everyone may download it as of now from the official real website. I personally do not like Real Player that much and use the freeware Real Alternative to play the content of that player. There might be however some users that actually like the player and would like to tinker around with the beta version. According to Cybernetnews the beta was not supposed to come out until the end of June. I can't really say much about the changes that have been implemented. 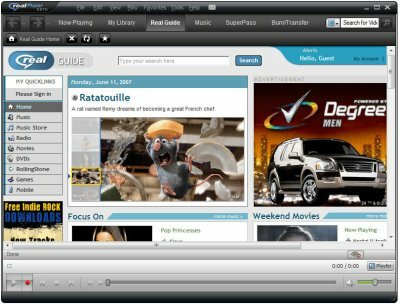 One feature is a video downloader that lets you download videos from Internet video hosting sites directly and play them in Real Player afterwards. It will also ship with VCD / DVD burning options which are available depending on the edition of Real Player that you use (have purchased). The basic free version seems to ship only with VCD burning options. While it seems to add several new features I have not seen anything that can't be achieved with other free tools. I can download the videos using several Firefox extensions or the Orbit Download Manager. Burning is of course more comfortable with real burning softwares such as Nero Burning Rom. Update: You can download the latest version of Real Player, which is version 15.0.6 at the moment, from the official Real website. Faster video downloads and transfers (according to Real up to three times as fast as the free version thanks to parallel downloads). Support for additional video codecs. Export the media library as pdf or print it. Create digital recordings via microphone and other analog audio sources. Complete your music collection by adding covers, removing duplicates and tags. i’d bet on it, especially in this case. i mean, who was really anticipating a new version of /Real Player/? I haven’t used Real Player in years. It was useless, came with a lot of bundled junk and could never be uninstalled properly. There are plenty of free and open source players that do a better job. Yup, RealPlayer always had tons of bundled junk included, but new version on presentation looks very impresing. But still there are free alternatives which for sure don’t spy user and forces him to watch ads. Great. Download is always the best solution for the videos. RealPlayer 11 Beta is my favorite program ever. I bought the paid version even, I like it so much. There are lots of ways to download Flvs, lots of ways to convert them, lots of way to burn them to disk.